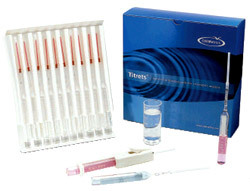 Chemetrics Titrets kit for sulphite in wine. Sulfites have been used for centuries to sanitize and preserve foods. They are used worldwide in the wine industry as antioxidant and antimicrobial agents. However, sulfites have been identified as causative agents in certain allergic reactions suffered by asthmatics. As a result, the FDA and the Bureau of Alcohol, Tobacco, and Firearms have mandated that sulfites in foods and beverages, at levels of 10 ppm or higher, be identified on the label. CHEMetrics? sulfite test kit is based on the Ripper method, which the wine industry has used for years as a standard for rapid sulfite analysis. Sulfite is titrated with an iodide-iodate solution, using a starch end point indicator. Phosphoric acid is used to adjust the pH of the sample. Results are quantified using direct-reading titration cells. The test determines free sulfite as ppm (mg/L) SO2. Results for this test kit are acceptable for dry white wines (although they can have an error of up to 10 ppm). 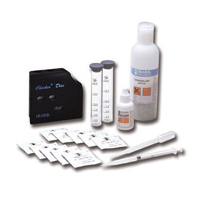 This test kit is not recommended for use with red wines or white wines containing ascorbic acid or tannin. These wines often give false high test results. Kit comes in a cardboard box and contains everything needed to perform 10 tests: ten ampoules, ten valve assemblies, instructions, and MSDS.